MUMBAI, India (CNN) -- In the aftermath of recent terror attacks, Muslims in Mumbai are speaking out against the carnage that left more than 170 people dead and hundreds injured -- including many Muslims. 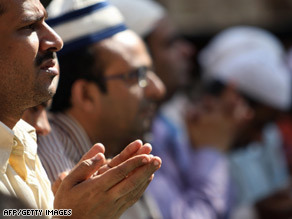 Muslims are shown at prayer Friday in Mumbai. "They (terrorists) claim to be doing this in the name of Islam. We have to tell them, 'Not in our name,'" said writer and activist Javed Anand, a Muslim. Scattered throughout Mumbai are several predominantly Muslim neighborhoods. Many Muslims in those communities say they were shaken by the terror attacks, and they are not hesitant to show their feelings. At a rally this week, the anger was clear as Indian Muslims marched and chanted anti-Pakistan slogans, even as Pakistan pledged to help in the investigation. Indian authorities say the terrorists involved were linked to an Islamic group in Pakistan. Meanwhile, Muslim graveyards in Mumbai have refused to bury the bodies of the nine gunmen killed during the attacks, on the belief that Muslims who commit such barbaric acts are not true followers of Islam. An estimated 80 percent of India's population is Hindu, compared to roughly 14 percent who are Muslim. In India's massive populace of 1.1 billion, the South Asian nation holds the third-largest Muslim population in the world, trailing just Indonesia and Pakistan. The Hindu and Muslim communities in India have a long history of tension between them. Though there have been no reports of sectarian violence in the wake of the terror attacks, there are fears violence could flare up at any time. Some Muslims in Mumbai say they feel vulnerable in their own city. "There isn't much communal harmony," said one Muslim man interviewed on a street in the troubled city. But in a show of solidarity against terrorism, many Muslims throughout India are organizing a silent rally for the near future -- one of several ways Indian Muslims are trying to distance themselves from the attackers. Still, the nature of such attacks, in their suddenness and randomness, raises questions for all Indians including Muslims. "When they strike, where they strike, who can say?"